A high quality long active HDMI cable. 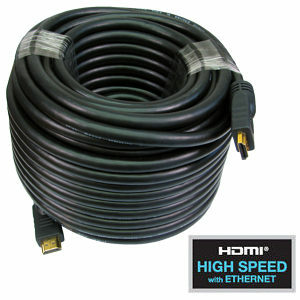 HDMI High Speed with Ethernet Cable. UHD 4k x 2k Resolution Support. Expanded Support for Colour Spaces. Active HDMI cables are directional and must be installed correct way round as per the cable markings. 2 Way Manual HDMI Switch Add an extra HDMI input a TV. Simple push button operation to select between two HDMI devices. Easy to install, just connect one HDMI cable from each box, eg Sky HD or Blu Ray DVD into the switch and one HDMI cable from the switch to the TV or Projector. HDMI to Component Video Converter with Audio. 5x Phono Inputs for Component Video and Stereo Audio Converts an HDMI output to a component video RGB input. Enables HD displays with component video YPbPr inputs to display HD sources. Video bandwidth 1.65 Gbps. HDMI input connector. Supports 1080p input and output. 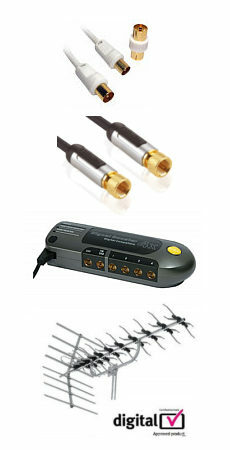 Supports 2 channel LPCM audio Compatible with Sky HD, Virgin V+, Freesat HD, HD Freeview and Blu Ray DVD. High Speed HDMI Splitter, 4 Way 4k and 3D Ready. Supports 1080p and 2160p 4k x 2k resolution. Supports HDCP content protection. 340MHz bandwidth/3.2Gbps per channel(10.2Gbps total) Supports 12bit per channel deep colour(36bit in total) Supports uncompressed audio Supports compressed audio Supplied with UK power supply.